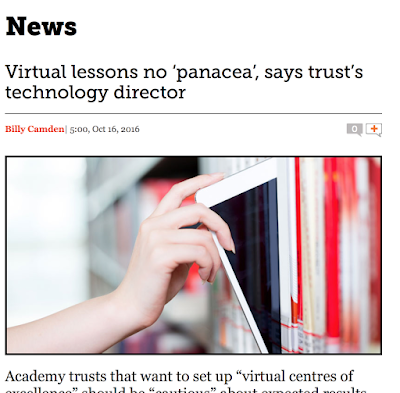 This article in SchoolsWeek quoted me last Friday. I am happy that everything in the article represents what I said to Billy, but at the time of our conversation I didn't fully understand the context of what he was asking me - so having read the article and the green paper it refers to - I thought I'd post more. For the sake of clarity, the green paper (page 27) refers to virtual centres of excellence pretty much in the context of selection and catering for the most-able. That was not the conversation I had - I was (and am, here) talking about online courses in a general sense. I think for any group of schools to establish an effective provision for online courses that are comparable in quality to what they would deliver face to face, there are some pretty serious challenges to deal with - they aren't all absolute barriers, but all would need to be addressed in some way. I'm using the term accountability in a very broad sense - what I mean is that all the institutions in the partnership for these online experiences need to be clear who is responsible, how it is going to be paid for and a whole plethora of details. I'm confident that within a Multi-Academy Trust that is a problem that can be solved, but not without thought. I think that it is more than just 'professional development' for staff. I think before online learning and blended learning can thrive there are certain behaviours that need to be commonplace. When a teacher finishes a lesson or creates a resource, is the default to make it available to all the learners (and colleagues) that can use it? If people are not comfortable with this, and don't do it as a matter of routine, then I'm doubtful about how reliable delivery of an online course will be. The thing I wanted to talk to Schoolsweek about was our programme of professional development for staff that is now rolling out - it is probably the most ambitious piece of CPD I've even been associated with (and I include within that the work I was involved in at SSAT). A core part of that is the ways staff share resources with each other and their classes as a default behaviour. If, when asked, someone leading on an online learning project can answer the question 'what tools will you use?' with a one word answer, they're probably in real trouble. I recently took a course online entirely delivered through Blackboard and even though I am highly motivated, was paying a lot of money (meaning dropping it was not an option) and was really interested in the content, it was a sterile, dull, monotonous experience. This post from Dom Nourish really made me think (Dom usually does!) - it sets out a vision of online learning that is based on social networking and relationships rather than content, content and a little media. I think that until learners are using a personal learning network (or as I like to call it a managed Personal Learning Network because I'm not too enamoured with an all-comers model for a student toolkit) rather than a VLE of some description, making an engaging course that stretches the ability of students (rather than their patience) good online courses are problematic. students have access to a managed toolkit of different kinds of apps and resources that they have a measure of control over, and include a social element. We can manage their identity and be confident that everyone is who we think they are and can access what they should. you can manage all the underlying plumbing about money, timetables and accountability.